This box is a big seller. The outside says it all: Very Romantic on high quality paper board, each box holds 150 Silk Rose Petals, scented and floatable, 4 tea lights to set the mood and an invitation to romance. One stop shopping. You may want to add other extras to the end cap, i.e. chocolates; champagne, etc. The tea lights are of high quality wax, giving a nice glow to the romantic evening. 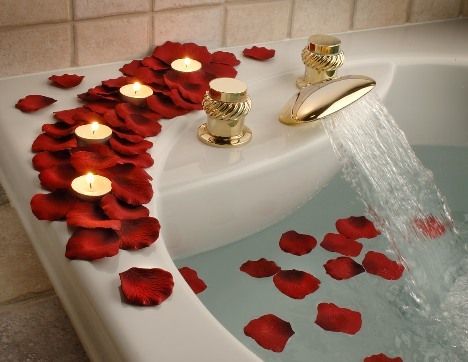 You can use it for showers, bedroom design, parties, anniversaries and of course Valentine’s Day. The possibilities are endless. The package needs no wrapping, it is a present and mood setter by itself.